Before anyone leaves a comment asking me why I’m directing this at wives, or why I “always assume it’s the woman’s job to work at the marriage.” I want to clarify a few thing. You see we get these comments at least weekly, almost daily. And here’s the answer. A good marriage is the union of two people working together with a Christ-centered focus. Both sides need that encouragement, but here’s where I fit in: I’m a woman, writing to women, from a woman’s perspective. The answer is that there are plenty of them. Many strong men of faith have a passion for encouraging other men. Some have written books, others are blogging. They’re out there. That’s not my mission or my calling. With that in mind I got to thinking about ways I might encourage you this week. Perhaps a story to spur you along in your faith… Then I remembered the sermon last Sunday, and how I dug through my purse looking for a pen. I don’t remember the specifics of the sermon, but the message of grace made its way through my ears to my soul. “There’s a story,” he said, “about a young boy in school. His name was Timmy. Every afternoon, Timmy would raise his hand several times asking to be excused for a tinkle. Perhaps this particular day his teacher was tired or he overused his bathroom privilege. Whatever the case was, he had to stay put. A short while later, Timmy lost it. His pants were wet, the floor was wet and he was frozen with fear. What could he do? Surely everyone would see it. He would never live it down? Just then Suzie walked by his desk carrying the goldfish bowl from the back of the class. Sploosh! She ‘stumbled’ and spilled most of the water on Timmy. Turning to look, the class laughed at how clumsy she was, while the teacher helped to clean up the mess and rescue the fish. After class, Timmy walked up to Suzie. “You did that on purpose, didn’t you?” he asked. Hearing that story I’m warmly reminded of grace. Not only has it been given to me by God, it’s also been offered to me by loving people who understand that we all make mistakes. Sometimes they are downright annoying. I remember making a lunch date with a friend once who drove 45 minutes across town to meet me and I didn’t show up. She had to drive all the way home–with her newborn baby–to call me because she didn’t have my number with her. Where was I? I was in bed sleeping. I had completely forgot about our lunch date and decided to take a nap. That’s just one of the many times I’ve needed some grace in my life, but let me tell you–the list is long. 1. Offer grace to your husband. He just might do something to set you off. Maybe he deserves your anger. Maybe he’s in the wrong. And maybe you have the right to start casting stones. You also have the opportunity to offer him grace. It wouldn’t be called grace if it wasn’t free and undeserved. Grace is a gift of love. It doesn’t mean that what he did is okay, it simply means that you are choosing love over condemnation. Jesus said unto her, Neither do I condemn thee: go, and sin no more. – John 8:11 (to the woman caught in adultery). Please note that I’m talking about everyday issues here, not the serious issue of marital abuse. If you are in an abusive relationship, I encourage you to speak to someone about it. Get help. 2. Restore one another gently. This should go hand in hand with number one. If there’s a problem in your marriage, it’s important to communicate your thoughts to each other in love. Being gentle isn’t always easy when you disagree with someone, but it goes a lot further than nagging or losing our temper ever will. Forgiving someone doesn’t mean that you condone their sin, and sometimes it must be communicated. 3. Speak the truth in love. One of the most powerful ways that a husband and wife can affect each other is through ongoing spiritual encouragement. Michael and I will often call each other just to chat about what we’re reading in the Bible. When it comes to our husbands let’s remember that we’re not their mothers, pastors, or teachers, we’re their partners. We were created to help them, to love them and to encourage them. 4. Keep his bad habits between you. Some women love to rag on and on about their husband’s bad habits. I get it–girlfriends love to talk about their families, but tearing him down can become a bad habit that should be nipped in the bud. Some situations, like abuse, should be discussed of course. But what I’m talking about here are the everyday bad habits that get under our skin like the way he relates to his mother, leaves dirty dishes around, or snores too loud at night. Rule of thumb: if it would make him uncomfortable, keep it between you. Of course, it goes vice versa, too, but that’s the part I have some power over. 🙂 I have clung to that over the years and it has been a great blessing to both of us, I believe. Dear Darlene, Hi. I loved this article very much. I may not be married anymore, but I do find your blog very insightful and it helps me day by day just knowing how much the Lord loves us. Thank you for sharing. I love Titus 2:3-5. God does ask us to encourage each other and you do that very thing. Thank you, Darlene. Your blog helps me help my daughter. She is thinking of marrying soon and I love sharing your blog with her. Great blog! 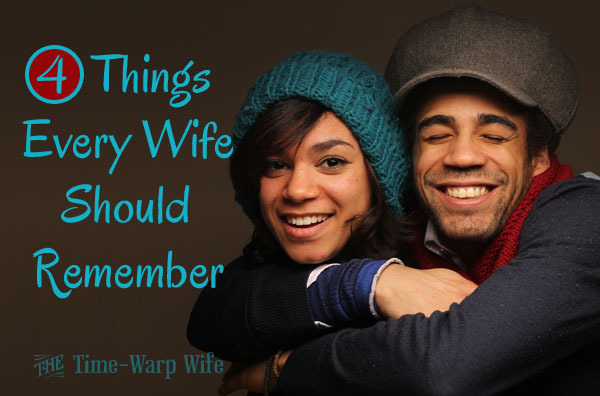 I really appreciate having your blog to help remind of what’s important in marriage. One thing that I’ve seen different between my marriage and some of my friends’ relationships is number 4. I hear other women talk about how much their husband aggravates them. I try to always share how much my husband helps me. To be sure, I do sometimes turn to girlfriends to help me through the tough times, but I don’t gossip about my husband’s bad habits. As a result I have a lot of friends that end up looking a little jealous of our good relationship. It also keeps me looking at the positive attributes my husband has instead of dwelling on that little thing he did last week. Thank you for taking the time to write down these 4 ways of encouraging us as wives to walk in God’s light. I so agree with #4 ” Keep his bad habits between you” Yes, I believe every women and man should hold these words to heart. I must also add not to only keep his or her’s bad habits to yourselves, but keep them away from his or her mother. Parent are very protected of their children, even when they are grown, and I have seem it so many times, a mother would take the side of her child, whether they are in the wrong or right. Look to God my friends, talk to God and He will give you the answers you need. Such a good point to bring up. I like it! Thanks Elissa. Such a great valuable post reminding us how we can better serve our husbands as their partners in life. I have to agree that expressing our husband’s downfalls in public is never a good thing. I do express mine out loud, but only when I feel it will really help other wives. My husband has also pushed and given me permission to expose some of our issues to the world in hopes that it will help others too. So, anytime I’ve ever spoken about our martial problems to the world, it has been with his consent and at times his insistence.